The University of Rochester Student's Association has named Biomedical Engineering and Neurobiology & Anatomy professor, Scott Seidman, The Undegraduate Engineering and Applied Sciences Professor of the Year. The award was presented at an awards ceremony in the Welles-Brown and Hawkins-Carlson Room in Rush Rhees Library. The ceremony and a poster session were part of the 2013 Undergraduate Research Expo that took place in the library on April 19, 2013. 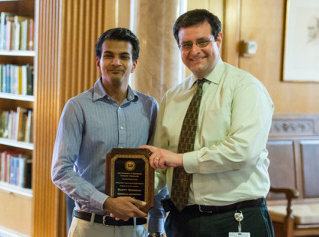 One of Dr. Seidman's students, Ankit Medhekar, BME class of '13, presented him with the award. Congratulations Scott!